Pete’s favourite dish at his favourite Chinese restaurant (the China Rose in Nesscliffe, for those local to Shrewsbury) is the sizzling fillet steak stir fry (the steak cut into strips, obviously! ), which comes in a savoury tomato sauce with lots of onions. I’ve never tried competing with it, because I don’t run a restaurant! However, there was a lamb steak in the fridge at home yesterday, which I wanted to make a stir fry with for Pete’s dinner, rather than the usual pan-seared one. I asked what sort of sauce he wanted with it, and he suggested a tomato-based one (hmmm, wonder where he got the idea). I guess he meant for me to get a bottle of readymade Szechwan sauce on the way home from work, but that wasn’t MY plan. I wanted to make the sauce at home (or an approximation thereof). I could have looked it up online but since it’s my favourite for its spiciness and I know more or less the flavour I was after, I just decided to wing it. Of course, this sauce being for Pete, I had no intention of making it as hot as it should ideally have been, but I kid you not when I say that it was absolutely PACKED with flavour and smelt so very good as it was cooking. I know this is only my opinion, but I really think that you should try it. 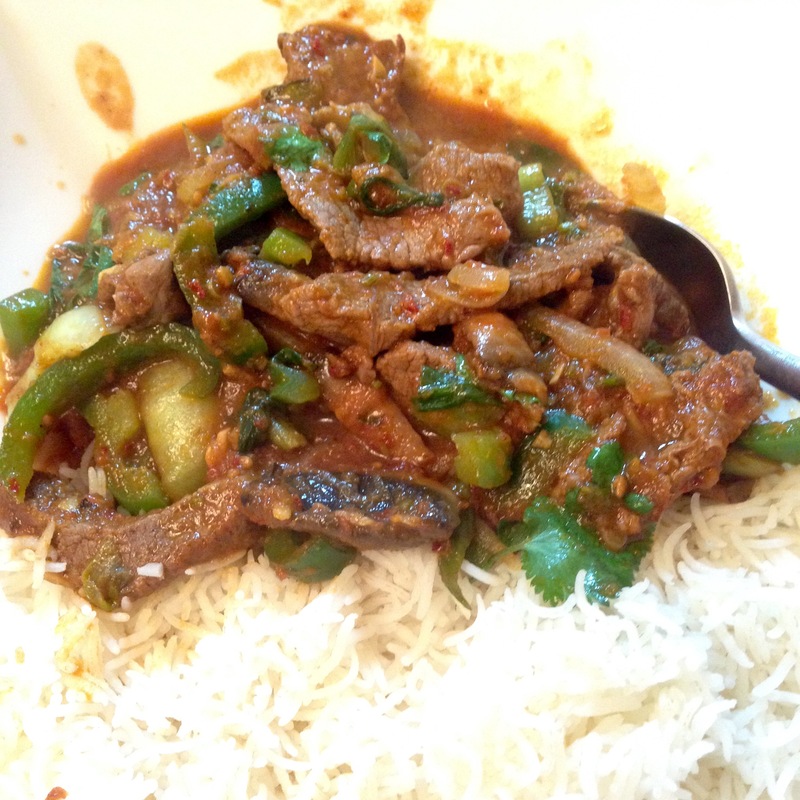 This entry was posted in Lamb and tagged Bell pepper, Chinese 5-spice powder, Kashmiri chillies, Lamb steak, mirin, onion, shallots, spring onions, szechwan pepper, Tomato ketchup, tomato paste on November 9, 2015 by shyameds.